...Mort Künstler met astronauts Bob Crippen and John Young? He's renowned as “the premier historical artist in America.” When Mort Künstler began his emphasis on Civil War art in the late 1980s, he had already accomplished more than a half-dozen artists could hope to accomplish in a collective lifetime. From portraits of prehistoric American life to the odyssey of the space shuttle, Mort Künstler had painted America's story. When he placed his focus on Civil War art, Mr. Künstler quickly established himself as the country's most-collected Civil War artist, and earned unprecedented acclaim within the genre of Civil War art. "Mort Künstler is the foremost Civil War artist of our time -- if not of all time," says Dr. James I. Robertson Jr., the dean of Civil War historians and the author of the celebrated biography, Stonewall Jackson. "To study his paintings," says Robertson, "is to simply see history alive." Pulitzer Prize-winning historian James McPherson concurs. 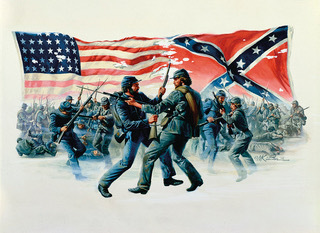 "Of all the artists working in the Civil War field," he observes, "none captures the human element, the aura of leadership, the sense of being there and sharing in the drama, quite like Mort Künstler. He has that enviable talent of being able to re-create history on canvas and to translate events into art." In 1998, the Nassau County Museum of Art in New York sponsored a one-man exhibition entitled The Civil War - The Paintings of Mort Künstler. More than 130 paintings, drawings, and sculptures were gathered together from around the nation. The seven-week exhibition attracted more than 30,000 visitors, surpassing the previous attendance record set by a Picasso exhibit. Due to the success of this exhibit, the Nassau County Museum of Art held a second one-man exhibit of Mr. Künstler’s work in 2006 entitled The American Spirit – The Paintings of Mort Künstler. Mr. Künstler continues to participate in a variety of charitable causes that are close to his heart. In 2001, following America's 9-11 tragedy, he contributed one of his most popular limited edition prints - "Old Glory" - for a fund-raiser by the American Red Cross. The non-profit program raised more than $150,000 for the Red Cross to use on behalf of the victims of the 9-11 attack. Since 1998, Mr. Künstler has been a supporter of Timber Ridge School - a residential institution serving emotionally disturbed adolescent boys in Winchester, Virginia. Sales of ornaments featuring his art have raised over $700,000 for the school. In 2003, a new residence hall at the school was named Mort Künstler Hall in his honor. In 2010 the Nassau County Museum of Art held their third exhibit of Künstler’s Civil War paintings in commemoration of the 150th anniversary of the Civil War. For Us the Living - The Civil War in Paintings by Mort Künstler consisted of approximately 50 paintings accompanied by a selection of documentary objects. For the first time, visitors to a Künstler exhibition gained an inside look into the artist’s creative process through a display of his sketches, drawings, and preliminary studies. Mr. Künstler was commissioned to paint an accurate depiction of Washington crossing the Delaware. Washington's Crossing was unveiled at the New-York Historical Society on December 26, 2011 - the 235th anniversary of the actual event - and received great critical acclaim. In recognition of the 150th anniversary of the Civil War, a collection of over thirty original Civil War paintings by Künstler have been on exhibit at various museums. This traveling exhibit started in February 2012 at the VMI Museum in Lexington, Virginia and continued on to the Virginia Museum of the Civil War at New Market Battlefield State Historic Park and the South Carolina State Museum in Columbia, South Carolina. During 2013 the Reading Public Museum in Reading, Pennsylvania will host the exhibit, followed by the North Carolina Museum of History in Raleigh, North Carolina. The traveling exhibit will conclude at the Washington County Museum of Fine Arts in Hagerstown, Maryland in 2014. On September 13, 2012, the U. S. National Archives in Washington, DC hosted “An Evening with Mort Künstler.” Mr. Künstler discussed pivotal moments in his career with Laurie Norton Moffat, Executive Director of the Norman Rockwell Museum, accompanied by a slide show of his works. Mr. Künstler was the sixth artist honored by the Booth Western Art Museum of Cartersville, Georgia with their Lifetime Achievement Award on February 15, 2014. He will join Howard Terpning, G. Harvey, Ken Riley, Fred Fellow, and Glenna Goodacre as the only honorees in the history of the award. In recognition of the 150th anniversary of the Civil War, a collection of over thirty original Civil War paintings by Künstler have been on exhibit at various museums. This traveling exhibit started in February 2012 at the VMI Museum in Lexington, Virginia and continued on to the Virginia Museum of the Civil War at New Market Battlefield State Historic Park, the South Carolina State Museum in Columbia, the Reading Public Museum in Reading, Pennsylvania, followed by the North Carolina Museum of History in Raleigh, concluding at the Washington County Museum of Fine Arts in Hagerstown, Maryland in 2014. In 2013, Künstler began a major body of work on the American Revolution. These new works were featured in the book The New Nation: The Creation of the United States in Paintings and Eyewitness Accounts – The Art of Mort Künstler published by Sterling Publishing in October 2014. The Heckscher Museum of Art in Huntington, NY, curated and hosted an exhibit of these new paintings in Mort Künstler: The New Nation, December 10, 2016 through April 2, 2017. The exhibit featured 34 works in all, including Künstler's classics, Washington's Crossing and Reading the Declaration of Independence to the Troops. The Norman Rockwell Museum in Stockbridge, Massachusetts held a major retrospective exhibit of Mr. Künstler's paintings from November 2014 to March 2015. The exhibit titled Mort Künstler: The Art of Adventure included over 80 pieces from early childhood work through his most recent works. The exhibit travelled through May 2016, being on view at the Museum of the Shenandoah Valley in Winchester, VA, The Citadelle Art Foundation in Canadian, TX, and The Long Island Museum of American Art, History and Carriages in Stony Brook, NY. Probably no other artist in our nation's history has recorded so many events in American history and certainly no one has painted them with the extraordinary authenticity and drama as Mort Künstler. Mort Künstler is America's artist. While a student at Pratt Institute in Brooklyn, during the summer of 1949, Mort Künstler went to Mexico and traveled around the country for more than two months on a bicycle. He would stop and do at least one water color every day. 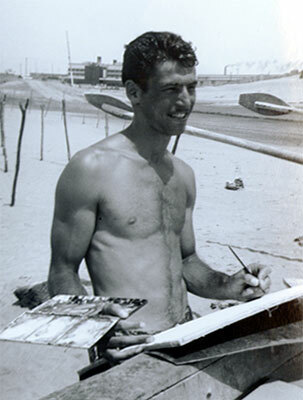 Here Künstler is painting one of the watercolor works on the beach in Vera Cruz.